I am independent writer. I am currently writing the third novella in the Film Noir series, Film Noirs and Pullman Cars. This will be released in December, 2018. Please subscribe for the latest snippets and for the progress of P.I. Sterling. Released on June 1st, 2018. …I moved briskly in and out of doorways, slipping and sliding on wet steps and cobblestones. Keeping apace in the shadows, I paused to take a breath. Then leaving the uneven-dappled ground, I followed. Raising my hand to shade my eyes from the bright sunlight, I squinted down a rail towards a tram stop. I stood and watched and waited - minding someone else’s business. Still believing I was inconspicuous, I was suddenly startled by a violent two-handed shove in the base of my back. I found myself face down, next to the rail, chewing gravel, inhaling diesel and in need of smelling salts… I must not have evaded those thugs after all! I twisted my head up, straining my eyes to see a crowd of interested observers; their pale faces and pitying eyes hovered over me as if about to witness my last rites - and maybe they would. 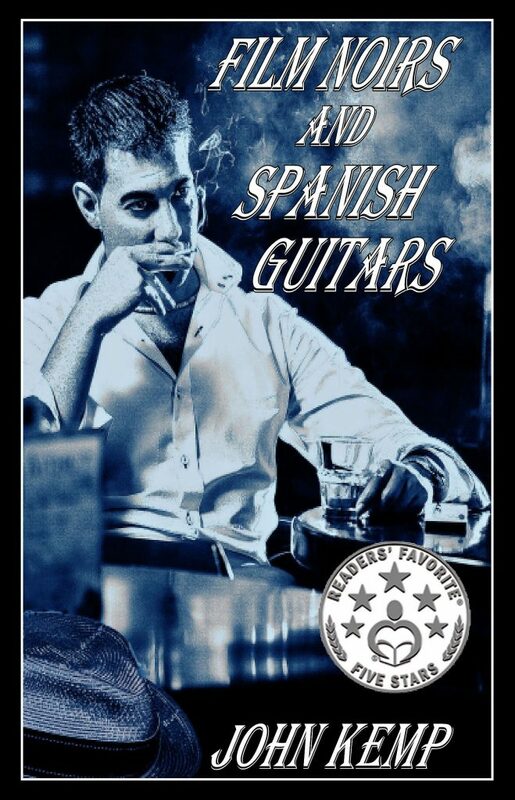 "Go undercover and discover the underbelly of Manchester in the exciting novella, Film Noirs and Spanish Guitars (A Sterling P.I. Series) by John Kemp. Sterling may have his issues, but he uses them to expand his experiences of life. I really enjoyed reading this novella. I am great fan of the noir genre. I enjoyed the story; it was fun and upbeat in a grimy sort of way and held all of the thrill and shadow play of a classic noir. Regardless of how you like your thrillers, this story is a great intriguing read. I look forward to the next installment! I would recommend this book to lovers of mystery, noir, and light, cozy crime reads." ~ Alyssa Elmore, Readers' Favorite. "This is the second novella in the Film Noirs series, but it can be read as a stand alone. As the title reveals the style is against the backdrop of the Film Noir genre with its wonderful narration reminiscent of that genre. PI Sterling investigates the case of a missing person and gets himself into several awkward situations. This second book develops the main character of the series and there is much more.... of his witty dry humour. It’s a quick read and certainly recommended for any murder-mystery fan, and for those who want a reading trip down the Film Noir memory lane." ~Alan Bester. "John Kemp's private investigator Sterling is back in form! Staying closer to home and strictly business for this outing, Kemp puts our hero right into his latest case. The tough talk and shadowy moods are there, and a few twists. This is a highly recommended book series that's fun to read. In future installments, I would like to know more about Sterling's past and his son. Looking forward to the next adventure: Sterling rides the rails!" ~J.P. Farley. With his latest novella John Kemp dives into the film noir genre, & in Sterling he has created a memorable character who could easily have stepped out of the pages of one of James M. Cain's classics; I personally would cast Robert Mitchum to play him in the movie version. Sterling is cynical and world-wise but is self-deprecating about his faults and failures, and colours his running inner monologue throughout with a sardonic humour that makes him a most agreeable tour guide into his seedy underworld workplace; along the way we meet a host of other equally memorable characters who crawl in and out of the shadows to wreak havoc for Sterling. It is clear that the author has an abiding affection for film noir and he more than ably captures the settings and speech that give noir its distinctive sense of time and place. I eagerly await the next chapter in Sterling's story.